Regardless of where in the world you hail from, most of us are going through some sort of seasonal change right now. 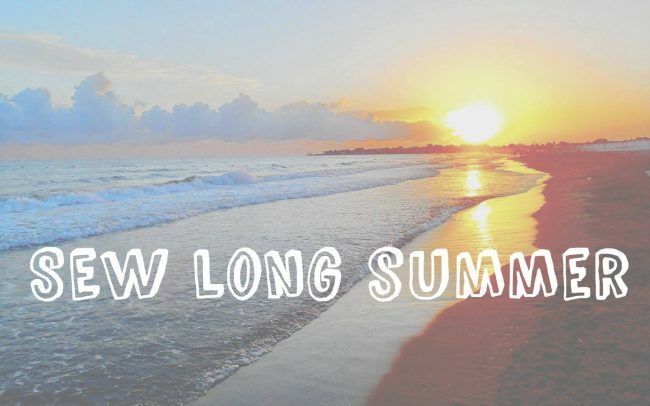 In my little corner of North America, that means the transition from summer into fall- always a little bittersweet for me, because Summer is my favorite season, and I’m always a little sad to see it go. I spent much of this summer traveling, traversing about 3000 miles in our little RV (ok, not so little- I’m a total GLAMPER), loving life on the road. Did I miss sewing? Sure! But it gave me a lot of great insight into what I actually wear. When you have to trim down your closet to fit into a single space that’s largely taken up by a pack n play (yes, the baby sleeps in the closet), you really get to see what you love to wear, and what you don’t. What did I notice? 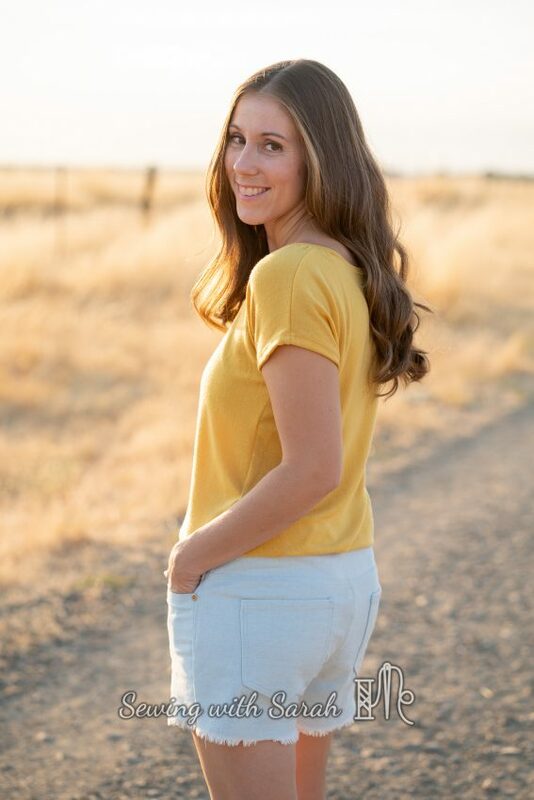 We traveled through a variety of climates, but T-shirts, tanks, and knit sweatshirts were always on the top of my pile- as were leggings, and jeans (when it was cooler). 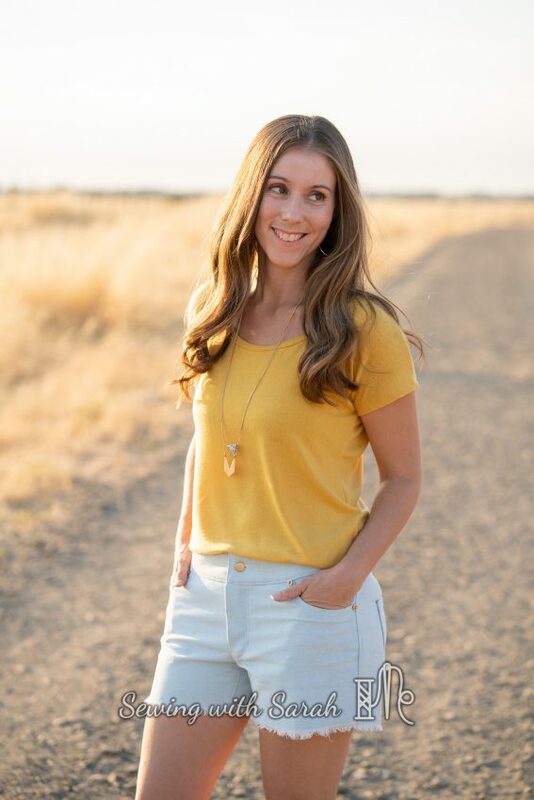 My main bottom wear, though, was a pair of Mavi Cut-offs I grabbed from Stitch Fix many years ago. 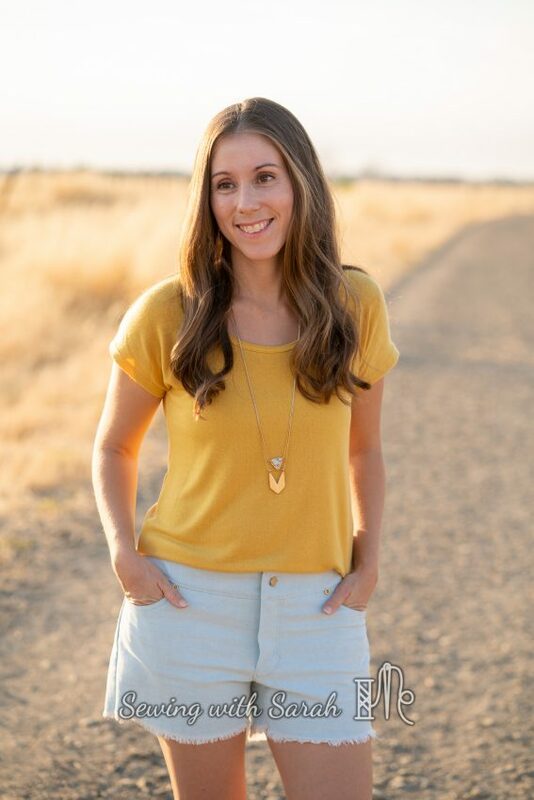 They’re tight right out of the dryer, but loosen up nicely with wear (traveling around in an RV means you can’t be shy about wearing the same shorts 4-5 times between washes), and match pretty much everything. Granted, I’m not going out to a fancy dinner in these cut-offs, but other than that, they fit my casual lifestyle perfectly. Which is why, before I said goodbye to summer and all our happy travels, I had to make myself a DIY version of my favorite cut-offs, so I could look forward to wearing the crap out of them next summer. 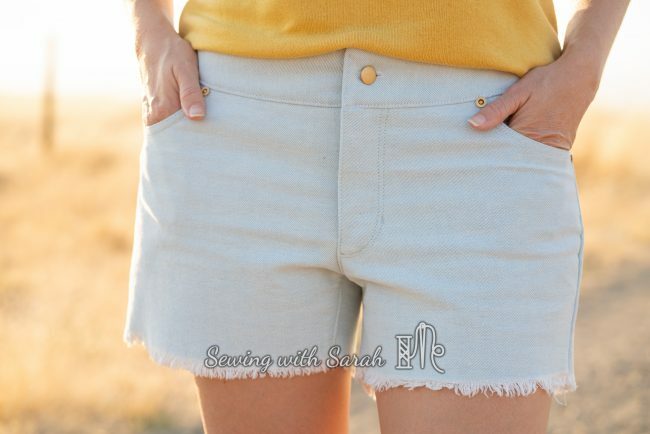 I chose the women’s Linden Shorts by Sew a Little Seam, since the test popped up at exactly the right time, and some amazing designer end denim from Cali Fabrics. This stuff has no real stretch, but a fabulous broken in feel, and I knew they’d mold to me like a glove. 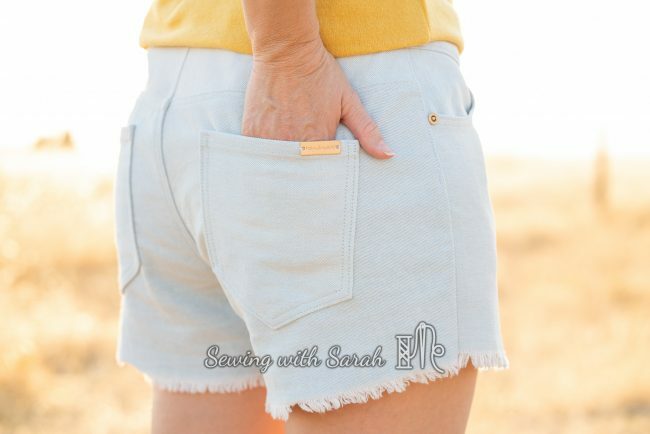 I decided to use the selvedge edge of my denim to keep the “cut off” look, which meant I didn’t even have to worry about hemming (if you’re going to do this, make sure you subtract the hem allowance before cutting)! I made a size 0/2 in the Lindens, and found them a tad bit loose (especially in the center back), but Kelly took them in a bit for subsequent versions, and I love them even more for that extra bit of comfort room. No other fit adjustments were needed- I think shorts are a really easy way to get your feet wet in making jeans, because they contain all the techniques without half of the fit issues- for me anway, as all the fit problems I had with the Gingers were below the knee, which I blissfully avoided by making shorts this time! Having learned a few jeans making lessons from that experience, I opted for regular (rather than thicker topstitching type) thread, and used a hoop jumper for those really bulky parts. I omitted the belt loops, which I later regretted, but if I’m feeling motivated they’re easy to go back and add later. In reality, I don’t usually wear my shirts tucked in, so they wouldn’t be a visible detail anyway. The instructions are excellent, and very similar to the construction of the Ginger Jeans I made last spring, which came in handy. I still struggled with getting the rivets in the way I want them, and ended up with fewer than I’d like because I ruined a couple in the effort, and didn’t have any more to replace them. 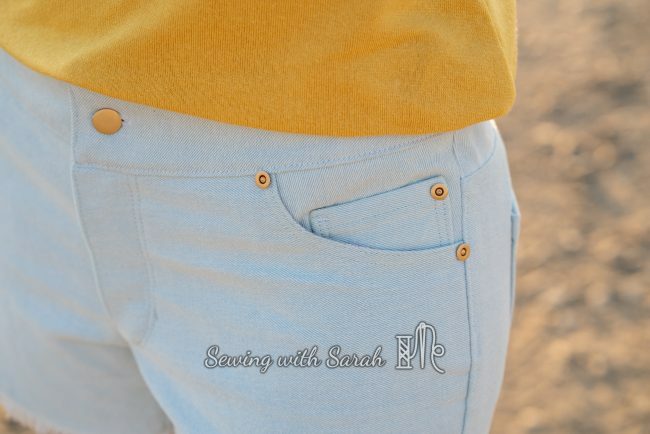 Since my birthday is this month, I think I’ll gift myself a professional rivet/jeans button press kit (recommended by Closet Case Files here) so I can get a totally professional finish next time. I’m also going to need to make another trip to San Francisco soon, because I REALLY need some more of that denim! I added a little special touch to the back in the form of a metal “handmade” label I picked up at from Amazon– I sure hope my handstitching was enough to make it stay put, because I really love it! I won’t lie and say I’m now ready for summer to end, but I am quite happy that I managed to squeeze these shorts out of the last dregs of the season, and plan to wear them until the goosebumps set in! As a little aside, the shirt I’m wearing is another Dublin Dolman, made out of some awesome sweater knit from Surge Fabrics, back when they had their designer end sale. Binding it was NOT easy, but I used this tutorial, and am pretty pleased with the result, and especially love that I got what feels like a Banana Republic sweater for about $10. Winning! If you’d like to join in on the “Sew Long Summer” theme, you can enter to win a store credit to Simply by Ti Fabrics by following the directions below! Note: this post contains affiliate links, which help me keep up the blogging by feuling me with coffee and fabric. Thank you for your support! I love your cut offs! Super cute. As always an enjoyable read. These are adorable! It looks amazing and the hem finish a great idea. Yay! You are all set for next summer and the hot days that are hanging on. Using the selvedge for the hem was genius! You look great, as usual! These shorts are marvelous! 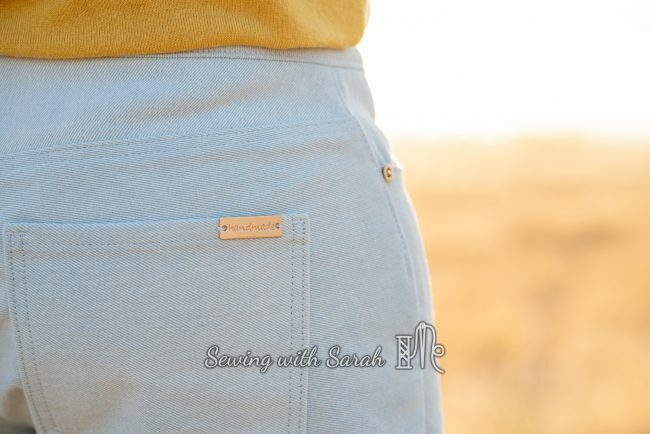 Such an excellent idea to use the selvedge!